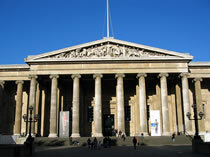 The British Museum is one of the most iconic buildings in London. The collections are open to everyone from all over the world and access to the museum is free. However, there may be a charge to view some temporary collections. Housed inside the world's oldest museum are over 6 million artefacts from across the world. Many of these are over 1.8 million years old. The British Museum was founded in 1753 when Sir Hans Sloane, a physician and antiquarian, left his collection of artefacts to be shown to the public when he died. Since then, the collection has been added to by various travellers, including Lord Curzon, Captain James Cook and Lord Elgin. There are three principles which the British Museum has followed since its foundation: the collections must be held in perpetuity in their entirety; they must be widely available to all who seek to enjoy and learn from them and they must be curated by full-time specialists. The building the collections are currently held in was completed in 1850. In 2000 a new addition to the museum was built where the courtyard, surrounding the Reading Room, and is now known as the Great Court. This is covered with a glass roof and now holds a restaurant, shop, café and a study centre.